This post is a follow-up to the earlier post Poor at mind reading? Snap a copper and get ten years in the slammer about Section 76 of the Counter-Terrorism Act 2008. 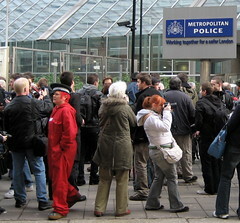 The pictures are from the event 'I’m a Photographer … not a Terrorist' at New Scotland Yard. The new offence of eliciting, publishing or communicating information about the armed forces, security and intelligence agencies or the police contained in section 76 of the Act is designed to combat the activities of those whose conduct might assist terrorists. We judge that members of the police and UK intelligence services are regarded as potential targets by Islamist extremists in the UK. We accept that this is a wide-ranging offence, but to mitigate this we have put in place robust safeguards. First, it is a defence to for the defendant to prove that he had a reasonable excuse for his action or possession. This burden on the defence to show a reasonable excuse is an evidential burden only (not a full reverse burden of proof). This means that the defence need only raise an issue with the evidence and it will then be for the prosecution to prove beyond reasonable doubt that the offence was committed. Second, in keeping with other serious terrorism offences, section 117 of the 2000 Act applies. This provision requires the Director of Public Prosecutions to consent to any prosecutions of this kind, thus providing a safeguard against any alleged spurious prosecutions. Perhaps most importantly, we believe that the principles set out in R v K, which considered section 58 of the 2000 Act, would apply to this offence. Here the court considered that the possession or act must raise a reasonable suspicion that it was intended to be useful to a person committing or preparing an act of terrorism. We therefore consider that the offence contained sufficient safeguards to protect the suspect. [Section 76] is open to wide interpretation or, rather, misinterpretation. How, for example, will it be expected to apply in practice to the 2012 Olympics, which will be both a photo-event par excellence and subject to an intense security operation? Does the law mean tourists are going to be rounded up and arrested en masse for taking suspicious photos of iconic scenes around the capital? That will work wonders for the international reputation of the London Bobby and for the city as a whole as a welcoming destination. If there is a terrorist attack in the capital, will the media concentrate their efforts on fire and ambulance crews and prudently avoid broadcasting or publishing pictures of police officers, rendering them invisible to the public? Police and photographers share the streets and the Met Federation earnestly wants to see them doing so harmoniously. Good relationships between the police and media benefit everyone, including the public, which both sides exist to serve. As things stand, there is a real risk of photographers being hampered in carrying out their legitimate work and of police officers facing opprobrium for carrying out what they genuinely, if mistakenly, believe are duties imposed on them by the law. This is unfair on everyone and completely avoidable - hence, the Met Fed's call for joint action to produce a mutually-agreed code. We do not want to become the ‘secret’ police.